With all the hype that built up to the second leg of the Triple Crown yesterday at Pimlico–and all the Pharoahnies gathering steam as the week came to a climax as their hero (American Pharoah) winning the Preakness–it would have been easy to dismiss everything that happened right up until the moment the gate broke for the Big Race. Unfortunately, it’s too easy to get caught up in the hype, and to forget that other horses are racing in undercard races that same day–and that, to their connections, those horses are just as important as the Big Horse du Jour. Those races mean just as much to the horses and their humans as all major stakes races, added together. Fortunately, real race fans can step back a moment, and get emotionally and financially involved in the undercard races. We fans watched those races, in person and on TV; at simulcasing spots and on our computers. With the name of Mr. Zayat–American Pharoah’s owner–all over the media in the weeks before and following the Kentucky Derby on May 2, it was good to get a reminder yesterday of someone whose family has long been a part of horse racing in America. Indeed, whose family legacy is etched in platinum. I won’t even attempt to write a full history of the Janney family in American racing–that would take a book–but for the purposes of this piece, I’ll just remind you that owner/breeder Stuart S. Janney III comes by his horse savvy in the most legitimate of ways. And that yesterday, Ironicus, a Janney horse, showed the world why he was worth watching. Besides breeding and racing his own horses, Janney III speaks on behalf of horses and horsemen via his involvement on the boards of the Keeneland Association; NYRA (the New York Racing Association) and The Jockey Club. So yesterday, when all the world seemed to be on edge, waiting to see if Pharoah would win the Preakness and move on up Route 95 to Belmont–yes, other horses raced, and a legendary American racing family once again graced the winner’s circle. Stuart S. Janney III’s Ironicus romped to victory in the Longines Dixie Stakes, a thrilling $300,000, 1 1/16 turf race for three-year-olds and up. Ironicus, a handsome grey/roan son of Distorted Humor by A.P. Indy mare, Meghan’s Joy, won his stakes debut under the brilliant tutelage of legendary trainer, Shug McGaughey. Jockey Javier Castellano gave Ironicus a great inside trip, and the two charged ahead to win by three lengths on a very firm turf course. To paraphrase the credit card commercials, the rewards of winning are priceless, and were presented in the winner’s circle following the 114-year-old race. Trophies are wonderful, but Longines—the Swiss watch manufacturer known for exquisite timepieces–gifted Ironicus’ connections with something just as beautiful, desirable–and, if I may create an adjective–juicy-gorgeous. 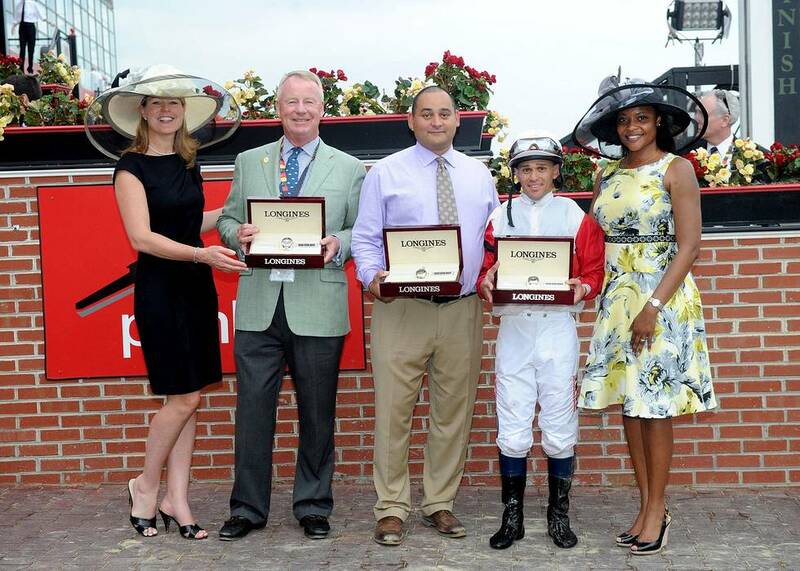 Janney; assistant trainer Robbie Medina and Castellano were presented with Longines Conquest Classic timepieces by the elegant Jennifer Judkins and Zaneta Sampson of Longines. A family that has helped sculpt American racing into a world-class sport deserves this recognition and reward that Longines graciously offers to winners of named stakes races. Longines is an extraordinary supporter of horse racing (and many other equestrian sports), and have earned their own round of applause from race fans. Truly, Longines is a valued friend to our industry. Without Longines’ support and painstaking efforts, our sport would not be the same. I write so often about the elegance of horse racing (as opposed to human-centric sports)–and Longines is the perfect sponsor and timekeeper for a sport that holds dear ancient rituals, while simultaneously requiring split-second accuracy. History is made, and records broken, in heart-stopping moments. But as human hearts skip a beat, the official timekeeper cannot miss a nanosecond. Stuart S. Janney III, Ahmed Zayat and all the connections of every horse racing this Triple Crown season can know, beyond a doubt, that their horses’ races into history books will be timed, perfectly.